Orang kata bagai pungguk rindukan bulan. Mengharap kasih pada yang tak sudi, hanya mampu memandang sepi, menunggu sesuatu yang tak pasti. Orang kata bagai bulan di pagar bintang. Sungguh cantik tak tertanding. Walau dikelilingi intan permata, namun kau tetap yang satu pilihan hati. Orang kata bagai bulan jatuh ke riba. Walaupun mustahil, tapi kalau sudah namanya rezeki, yang tidak disangka pun boleh menjelma depan mata. Biarlah apa orang nak kata. Kau tetap bulan terang yang bercahaya walau jauh di angkasa. Moga sampai masa untuk kita bertemu, bersua muka, meluah rasa dan bercerita. Kau perlu tahu betapa masa bukan kayu pengukur. Buktinya seperti mana fenomena Supermoon yang viral sana sini. Sudah 69 tahun lamanya tidak bertemu, hari ini ia menjelma kembali menerangi bumi. Menggembirakan hati segenap makhluk seluruh pelusuk alam. Jika ini manisnya harga sebuah rasa, maka 18 tahun lagi pun sanggup di tunggu, menunggu masa supermoon kedua di depan mata. Begitu juga hadirnya kau dalam hidupku. Akan ku tunggu bila sampai waktu. Dan bila dia kata kun, maka fayakun. Alhamdulillah untuk peluang menjadi saksi kebesaran ilahi. Supermoon 14112016 en route Bote - Ipoh. Nothing lasts forever. Be it in term of living things or non-living things. And I think that everything here would also include feelings and relationship. We have to bear in mind that we are all imperfect. We have flaws. We are lack in term of so many ways. So don't worry my dear; because it is okay to lose and be lost. Sometimes we need no reason to be parting ways. If you were to be asked of the reason being separated, the only answer that you may tell them is 'Just Because'. You do not have to have lengthy explanation or valid justification when the only thing would matter is you, yourself. I read this somewhere "No matter how good you are, you can always be replaced." True enough. But, let's see it from different perspective because people might see you as being too much of yourself if you think you are good enough for others. For me, it does not matter whether you are good enough or not, once the purpose is no longer valid, you are not needed anymore. So you might just go rather than you linger around hoping for miracle to happen. Because when you put expectations, or have high hopes that it would be like usual, it just wont be that way. It hurts you deeply to the core. It takes time to heal. As cliche as it can be. You might be hurt. You might be broken into zillion pieces. You might lost yourself. But, sooner or later you will stand up feeling better, even if it is not like before, but you may be recovering bit by bit. "If you were to be an animal, what would you want to be?" "I want to be a bird so that I can fly high in the skies. Free from anything." "But you know, if you were to be a bird, you will be shot dead." And, there goes my dream to be a bird. Kids can be very critical at times as how they hold their honesty. They see things from different perspectives, those angles that we have left it somewhere while we are busy growing up. We lost the child in us. Apparently throughout the process of growing up, we have been compromising our beliefs to most of the things that we tend to lose ourselves. Succumbing ourselves to people's wishes and orders. Believing others are superior and we are powerless. Being timid as we are afraid to open up and speak up. Being the Yes-Man who agrees to those narrowed minded people who are forcing us to think out of the box; but keep and lock us inside the box, nowhere to go. Then we realize that life is unfair and growing up is challenging. It is full of surprises which consist of a series of audacious decision makings as we could not foresee our future. The only choice we have is to just live life to the fullest with the hope that we would not turn back and regret later. 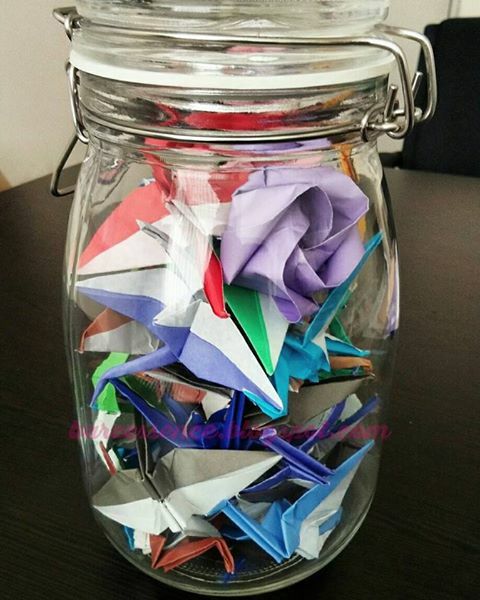 *On the other note, it is so ironic the fact that I love birds because they can fly freely, yet I keep them in the jar instead. **Let me keep you here, safe and protected. Grounded. He has been missing his father like I have been missing mine. "Its okay love, everything will be just alright"
I can replay the voice over and over again. Thanks Max Steel for reminding me of my longing. 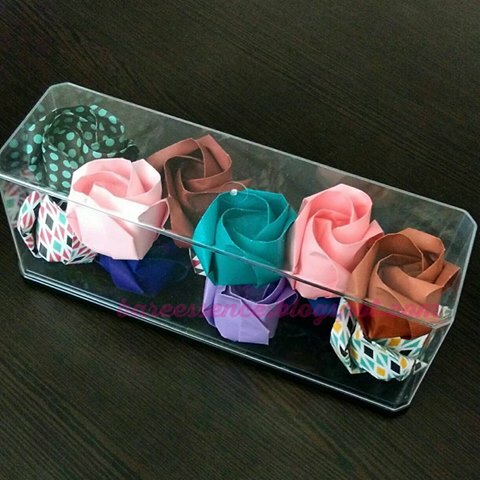 A friend told me that she likes my clear box of folded paper roses and she asked me the reason behind it. It took me a while because I have lost the thought of it. I was struggling to think any of it and to let it out. I know I have the reasons of doing it, but being asked spontaneously, I lost all the reasons I have before. Then, I figured it as the resemblance of beauty. That beauty should be kept well and hidden. But nahhh... No its not! I told her, maybe its about the one sided love. An underprivileged state of being able to love but not to be loved. Tak sangka sudah 8 tahun usianya. Segala macam cerita, yang duka, yang lara, yang bahagia dan yang gembira semua terluahkan di sini. Ibaratnya seperti setiap sisi kehidupan mampu disingkap dan dikenang melalui setiap bait kata yang terzahirkan. Thus, to commemorate this meaningful day, let's take a stroll down memory lane on the very first day, the first entry of this blog. Wednesday, October 15, 2008 at 1.42pm. Bila rindu itu datang lagi. p.s.s. Dan, pastinya rindu itu datang lagi dari sisi dan posisi yang berbeza. Tapi rasa itu tetap rasa yang sama. Rindukan sang dia ikhlas dari seorang pemuja. 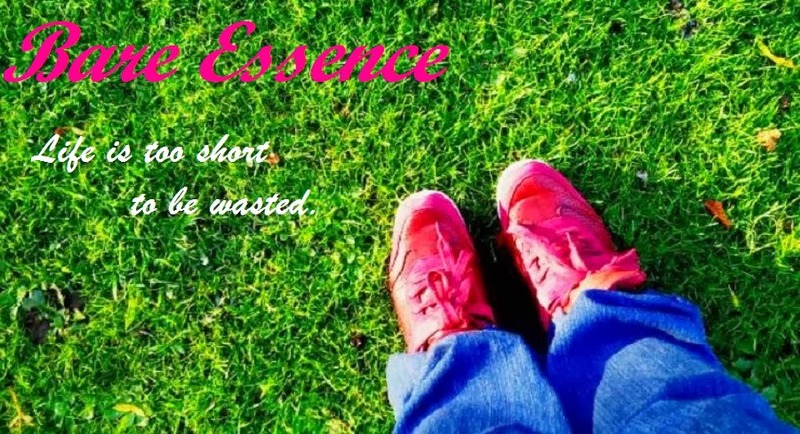 Life is too short to be wasted. Rejoice. Enjoy. bareessence©All Right Reserved. Theme images by hdoddema. Powered by Blogger.